What does it mean to be a farmer in the twenty-first century? Regenerative farming practices that are life-enhancing need to take root on a wider scale. We recognize that these practices need to replace those that are degenerative—harmful to soil, water, and diverse forms of life, including humans. As we endeavor to share ideas and stories that will carry us into a resilient future, we invite you to join the conversation on farming in the twenty-first century. When the Center for Humans and Nature set out to shape a question on farming, we asked Karen Washington and Leah Penniman if they would be willing to have a conversation about their work. 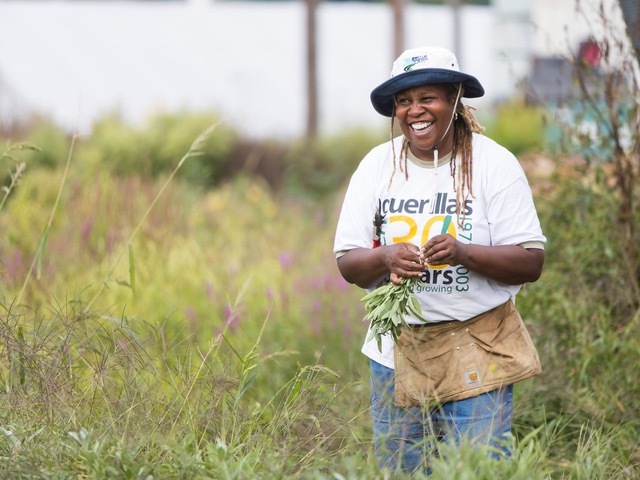 Karen Washington is a self-described farmer and activist; others have called her a food hero and the queen of urban gardening (Ebony magazine voted her one of the 100 most influential African Americans). She co-owns and farms Rise & Root Farm. Leah Penniman co-founded Soul Fire Farm and authored Farming While Black, based on her experience and lessons on the land. In the midst of their full days of growing food and community and traveling to teach and share their experiences, we gathered on the phone for a conversation. Sharing is a core part of both Karen and Leah’s philosophies around farming. When we spoke, they were just back from the Black Urban Growers (BUGS) conference, an organization that Karen helped to found that focuses on strengthening the network of Black farmers and food justice advocates. They shared open-heartedly about their journeys back to the land, the lessons they have learned from the land, and their visions for farming and our food system. Karen and Leah affectionately refer to each other as “mama” and “daughter.” Bound by the land and their work of reconnection, they are part of a chosen lineage. Kate: I want to begin by asking about this question of what it means to be a farmer in the twenty-first century: What do you think about? What does it mean to you? Karen: Okay, thank you. Well first of all, as a Black woman, I feel, in the twenty-first century, the fact that Black and brown people are starting to realize their connection to their past, and the importance of land. However in this century, the struggle continues. I mean, there continues to be racism; it’s difficult for farmers to get land. It’s still difficult to make a living. Most farmers still must have a second job, and there are still many obstacles based not only on race but based on gender and ethnicity. Leah: I’ll say everything Mama Karen said. Mama Karen is a mentor and dear friend of mine. I would not be a farmer if it was not for her, because when I was a young woman—I was a teenager just getting into farming—I had a lot of doubts about whether I belonged in that movement as a Black woman, looking around and seeing a lot of white faces at the sustainable farming conferences and in the rural landscape. I had no idea that Black folks had any relationship to land that was not circumscribed by the oppression of enslavement and sharecropping. So it was Mama Karen bringing us all together as the returning generation of rural and urban Black farmers that really made me realize that, as farmers, not only do we have a noble legacy thousands of years old going back to the continent, but we are the stewards of the future. We are the ones calling the life back into the soil and sequestering the carbon from the atmosphere and providing food to those who would never otherwise have access, those who are living under food apartheid, which is also a concept Mama Karen taught me. And so I really feel like farming is one of the most important things that we can be doing. And it is one of the great tragedies of the twenty-first century that we have so undervalued farmers that well over 80 percent of the people who are actually doing the farm labor are folks who are here on a guest worker visa and who are treated with horrendous working conditions and unequal pay, wage theft, and abuse. And so we really need to rethink how we are conceptualizing farmers and treating farmers in this century. Get weekly dispatches with the latest ideas from our thinking community. Kate: You both talk about food apartheid. How do you see the role of the farmer in changing that kind of systemic violence? I guess more specifically I could ask: What are you each doing on your farms and in your work, both as farmers and as leaders, to shift some of these historic injustices? Karen: Well, I can say I still live in the Bronx, even though I also farm upstate. The fact that you look at the food system in my neighborhood. It’s modern-day slavery, and I say that in terms of what the food system looked like back during the enslavement of Black people, in some instances we were given the leftovers that nobody wanted. If you look at my food system in my neighborhood, we have the leftovers that nobody wants. We have the processed food. We have the junk food. We have the food that nobody else wants, and so for me when I look at the food system, to me it’s like, “Wait a second. What’s happening here?” It’s like a genocide of people that is happening all over again. So when we talk about food apartheid, the reason why we bring it up is because food desert doesn’t cut it. Food desert doesn’t open up the conversation that we need to have when it comes to race, when it comes to income inequality, when it comes to so much. And so the food system, when people say that it’s broken: No, it’s not broken. It’s doing exactly what it’s supposed to do really in terms of the caste system, keeping people down, keeping people sick. As a matter of fact, last night one of my students was talking about the food system in jails: The food system within the jail system is another form of oppression that needs to be dealt with. We need to have a conversation around our food system, because at the end of the day, it’s the food system that is killing us. And for me, and I’m going to shout it out: It’s modern-day genocide and modern-day slavery. Leah: Mama Karen pretty much laid it out. To answer the second part of your question about what are we trying to do about it, there’s a Jewish teaching from Pirkei Avot that says, "You are not obligated to complete the path, but neither are you free to desist from it." This is something we talk a lot about at Soul Fire because it can feel like we’re just up against empire, you know—the beast—because we are, and what can we do as one farm or even upholding a natural network of Black farmers. But it is imperative that we do whatever small part we can. What that looks like at Soul Fire, which is a small community-run, people-of-color-run farm in Upstate New York, is we have a ujamaa farm share. Ujamaa means cooperative economics in Swahili, and we box up all the produce and the chicken meat and the eggs and herbs and fruits from our farm every Wednesday and we deliver it to zip codes that are labeled by the USDA as food deserts, which should be termed “food apartheid.” But people can pay whatever they can afford for those boxes, and many neighbors pitch in for the cost of the shares, especially refugees, immigrants, new Americans, and folks impacted by mass incarceration. So in that way, fresh food is getting to the communities right around us—Albany, Troy, and Schenectady—where there are not grocery stores, there are not farmers markets, there are not acceptable community garden plots, and so on. While we reach a few hundred families with this program, it’s certainly a drop in the bucket. We did take some time this past year and wrote out a step-by-step manual of how we do this program, what types of funding are out there, what are some other models. And we’ve been training farmers in our area and encouraging farmers like, “You don’t have to go broke to help your community. There are strategies and ways that you can take a portion of your harvest and share it with those who need it the most.” That’s important to us. We have a couple farms who are on board, setting aside some solidarity shares or some donated shares to make sure that we’re not treating food as a privilege but really what it should be, which is a fundamental human right. Kate: That’s really beautiful, and that’s something about your approaches that I really admire. A lot of people are working at various levels of the system, but you both went to the land and to, literally, the root to shape change. Why did each of you take up the work of farming? What was your avenue into it? Karen: I’m still the elder going first? Leah: I’m always letting you go first. Karen: So for me growing up, the message for farming was always in terms of slavery. It was something that people frowned upon, people ridiculed, they laughed about it. And so, growing up, no one spoke about farming because farming was like “you’re working for the man, you’re picking cotton.” And so, again, there are these stories that have been put in my mind, and so many other people’s minds, in terms of really getting us away from the land. It wasn’t until I guess I was in my mid-thirties and moving to the Bronx, where I had a backyard, that I decided to grow food. Once I tasted the food that I was growing, right then and there I knew something was up in terms of the food that I was getting from a grocery store. My relationship to food prior to that was from a grocery store. I never questioned where my food came from, never questioned the fact of who was growing it. Was it sprayed with pesticide or insecticide? How long was it stored? So as I began growing food in my backyard and then getting involved in community garden work in terms of empty lots. Then, I understood how precious and how important land was, and then I started to have the conversation with a lot of immigrant populations who were coming into cities and who already had the ability to farm. And sitting down and talking to them and listening to their stories, all of a sudden I said to myself, “there’s got to be some sort of connection, this land, this food connection that no one is talking about.” It was never even mentioned in a textbook, never even talked about in class, and so a lot of the information that I got was firsthand from speaking to elders, speaking to people who were already in farming, especially the new immigrants that were coming into my community who were just, I mean, they just wanted to get to the land. And we, as African-Americans, were trying to get away from the land. And so I realized how we have been brainwashed into thinking that we had no connection to the land. I finally realized how important and how strong and powerful the connection to land was. The real reckoning came for me, I would say, a couple of years ago while standing in the midst of the land and looking at the color of my skin. I realized that the color of my skin is the color of soil, and so putting my hands in that soil and finding that connection, right then and there I knew I belonged. And so what I try to speak to young kids out there: look at the hue, look at the skin color, that should let you know that you have a belonging to the land. So what I’m starting to see is that the connection of young people understanding, and Leah can speak to this as well—the energy—the young people are starting to understand the connection to land, the value of their power, the value of history, of storytelling, which is now moving, I mean, fast speed within the Black and brown community. Leah: That’s really beautiful. Yeah, that makes a lot of sense. I mean, for me, it’s sort of a trauma-rooted connection to land in some ways just because I grew up rural in a really white, very conservative, poor New England town. It was a hostile place to be a brown child and to be a poor brown child, and so my siblings and I, nobody would play with us. People beat us up. It was a hard time socially in the schools, and we didn’t understand why. We thought something was wrong with us. It was not until later that I developed a race analysis to understand what all those names meant that kids were calling us. So we just spent all our time in the woods. We played in the forest; we played with each other. We thought we invented Irreechaa religion, African traditional religion, because we would pray to Mother Earth and stuff, and we didn’t learn until later that we were just channeling our ancestral ways of knowing the divine. Because of my passion for the Earth, I started being an environmental activist at age six, picking up trash and going up to loggers in the forest and telling them that they needed to not cut down the trees or not hunt animals just for sport. My sister and I were very bold, trying to interrupt what we saw as the exploitation of our dearest friend. So when it came time to get a paid job, I was looking for something connected to the Earth, and The Food Project had a job. My mom lived in and around Boston, in different projects and temporary living situations, so I would spend the summer with her when she was able, and so that’s why I was looking for a job in that area. The Food Project hired me. I got my hands in the soil for the first time as a farmer, harvesting cilantro and hoeing rows of peppers and bringing that food to pantries and soup kitchens where we were feeding people who needed it. And I just felt in alignment. I was like, “I am outside. I’m using my body. I’m getting to take care of the Earth. I’m getting to take care of my community. This is the thing!” And I just kept farming after that. I went on to work at The Farm School in Athol, Massachusetts. Many Hands Organic Farm co-founded an urban youth program called Youth Grow in Worcester, Massachusetts, and then I moved out here and started Soul Fire. It definitely was not an easy road, choosing that path in the rural northeast, but it’s always felt for me like the Earth and the ancestors are not giving me an option. I have a requirement to do this work and to also be part of the homecoming of our people to a dignified and autonomous relationship on the land, so you will see me here on this land for as long as my body is doing me right. Kate: Hearing both of you speak just now, I’m hearing the community and the reconnection that this work offers. Is farming a way to build community? And how do you see that happening? Karen: It’s not a way to build community; farming should be community. I mean, how can you do this work in isolation? I know my back is breaking, my knees and my hips are calling out Arthur and Martha, arthritis. You can’t do this work alone. I mean, we come from community. What I usually talk to young people about is how I grew up in community. When my parents were working and my brother and I would come home from school early, my neighbors would tell us to come in, sit down, and they would give us a meal. When we didn’t have certain things such as milk or cereal, we could knock on the neighbors’ door and they would share. We’ve lost that sort of connection. But with farming, especially amongst Black and brown people, what we’re doing now is bringing back that sense of community. How can we grow food in isolation and see that the food is just going to one populace of people? We’re making sure that when we grow, we’re growing intentionally, so that regardless of one’s economic background, their ethnicity or their race, all people are privy to the food that we grow. And we grow in community. We encourage visitors to come to our farm. We encourage inquiry and questioning about their heritage and about their legacy. It’s very important people understand their connection to land and their power in land. So the conversation is definitely within community. It’s inviting when it comes to community. Our farms are healing farms. When there’s tragedy, we open up our farm to people to come and heal. They don’t even have to farm. They can come and be within the elements and just listen. You know, sometimes just sitting and just hearing the wind, just hearing the birds sing, just hearing your heartbeat, it’s something that we need to do as farmers. So for farmers that are out there, there is a huge community. It is not about growing food and feeding people and then coming home and just being in isolation. It’s about farming within community, inviting people to come to your farm and also to share what you have. I think for so long people have been working in isolation, and it’s been an “I” movement instead of a “we” movement, and that’s starting to change. I know it’s changed in our work. Leah: That’s so true. That’s so true, everything you said, Mama Karen. At Soul Fire we’re really blessed that this farm has been rooted in community since the beginning, and so there never has been—in fact, I sometimes long for—isolation. There is always folks up in here, and I’m an introvert! But, you know, the farm itself was started because when we were living in the south end of Albany on Grand Street, we were struggling ourselves, even with our master’s degrees and decade of farming experience and commitment to feed our newborn and two-year-old fresh food, to feed ourselves fresh food. There was no grocery store, just a packing store, with no plots left in the community garden and so on, so we ended up joining this CSA that was more expensive than our rent, and walking 2.2 miles with the children in tow to pick up the vegetables. That’s what it took. So when our neighbors found out that we knew how to farm, they were like, “When are you going to start the farm for the people? 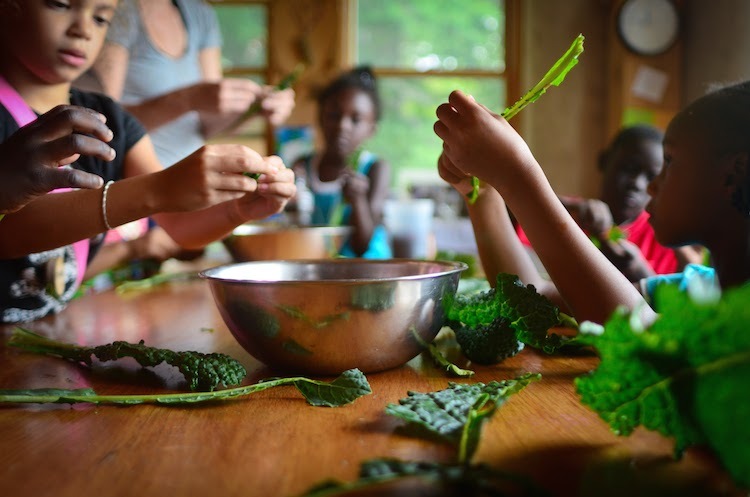 When are you going to feed us?” We’d had a dream of a farm for a long time, but that was really the impetus for creating a farm that specifically centered around food justice and centered around food as a basic human right. In 2010 we had finished building our home and the road and the soil, moved out here, and in 2011, started our CSA, which at first was just our neighbors in the community. Our neighbors would come out and pitch in and we would spend time with them, and then they started sending their young children and teenagers out to learn about farming and to be in a space that respected them and treated them like full human beings, where they were safe from the criminal invasion of the police and school system. So the community grew in that way, and then folks heard about us and were like, “There’s no training program for Black and brown farmers led by Black and brown farmers. Can you start something?” So we started having apprentices living with us and workshops, and kind of the rest is history, but it’s always—Right now there’s ten of us here living on this land together and working together, and it does quiet down in the winter; some folks go away and come back. But it’s not really logical, like Mama Karen said, to live any other way and certainly to live rurally any other way, because you’re very quickly going to work yourself to death or suffer from the emotional deprivation of loneliness. Kate: That’s an amazing story. Are there any favorite stories—things that the land has taught you, stories that have maybe been forgotten that you’re finding, or stories that you’re writing by being in active relationship with the land—that you would want to share with people, to amplify? Karen: Well, I think having the privilege of reading Leah’s book (Farming While Black), for me and so many of us, it’s our handbook. It’s a book that we must have by our side as we continue to farm. She has opened up doors for us to realize who we are. She points out the importance of listening to stories, the importance of giving permission to work on the land, and as an elder, sometimes for us to just sit back and be quiet and just listen. I am so proud that she did this book. She is sharing about crop rotation. She is sharing recipes. She is sharing stories. She is sharing budget. She’s opening up the farm and herself by giving this gift to us so that we can in turn do the same thing that she has done, and that is sharing. I think for too long, again, we have been brainwashed into thinking that resources and information should not be shared, that there’s an ownership. What this book has done for us is to say, “No, we don’t own the land, we don’t own seeds, we don’t own anything. What we do own is the ability to share.” And so I’m so proud of her for that. Kate: That’s beautiful. In the book, before you even start talking about how to restore the land or how to put your fingers in the dirt, you attend to the spirit of the land. Would you be willing to talk a little bit about your experience working with the spirit of the land? Karen: Well, for me, each and every day that I go out and look along the field, I have to give the Creator thanks and praise for my life. I have to be cognizant of the fact that when I stand on the land, the ancestors run through my body from the tips of my hands, my fingers, to the tips of my toes. When I look at the sky, I imagine how it was when there were no buildings, when there was just land, animals roaming free, and I let my mind and my imagination drift that way, and in some instances just stay in the presence, listening sometimes just to the wind as it howls throughout the farm and feeling the breeze. I am sixty-four years of age, so I have a little insight in terms of what time means to me at this point, and so I don’t take it for granted. Every time I’m on that land, I have to give the Creator “thank you” for the blessings that have allowed me to farm, that have allowed me to find the words to speak the truth. Even though sometimes at the end of the day my back is breaking, my legs are killing me, I can sit back and I can reflect and give thanks to a land that I don’t own—that I don’t want to own—but also to feel a sense of comfort that I have that ability to acknowledge the people who came before me. It’s a daily routine for me. People ask me, “What sort of prayer do you use? Who do you speak to?” and I can’t answer that for people. I can’t answer that. The spirit comes within me, and I feel that I have the ability to connect. Sometimes in the world we don’t hear those blessings. We don’t feel the spirit. We’re so in tune to what we have to do, what we should do, instead of just sitting back and allowing voices and spirits to come to you and find that place of respite, that place of serenity that I feel each and every day when I’m out there on that land. Leah: Word. Yeah. I spent a bunch of time in Ghana, West Africa. That’s where my spiritual elders and mentors are. In Manya Krobo, Eastern Region of Ghana, West Africa is where the queen mothers, the Manya Krobo queen mothers who are mentors of mine, spiritual elders of mine, live. And they were incredulous and asked me, “Is it really possible that in the United States, farmers will plant a seed and they will not pray, they will not dance, they will not make libations or any type of offerings to the land and expect that seed to grow and nourish their community?” They just couldn’t believe that. It’s unheard of in African—in any indigenous cosmology—to treat the land or the seed as a material thing only, as a pack of genes that’s just going to perform with certain inputs. That really influenced me, because I had a sort take-it-or-leave-it attitude towards engaging with the land as a living being in a spiritual sense, and now we’re very, very committed. We always have our planting festival. We always have a harvest festival. Before our Tuesday morning harvest, the farm team is down by the maize field giving offers to the land. We ask the land through divination before we do any major changes. And I do believe that having this intentionality about land as Òrìṣà, earth as Òrìṣà, as divine being, is part of the reason that our work has efficacy. It’s part of the reason that our crops do grow and that people continue to come and there’s a way that things just fall into alignment. We don’t have too many bugs. We don’t have any poison ivy. We always have enough water. I do believe that the Earth responds to love and loves us back. Kate: Oh, that’s beautiful. That’s so beautifully said. I have questions about the healing aspects of the work and the trauma. You both have referred to how the work of farming has been healing for you. I’m wondering if you could speak to that a little bit, how you see healing happening on the land. Karen: Yes, there is so much trauma that extends generation to generation. I thought myself, doing this work, that I was past it, but again, sometimes there’s certain things that may trigger, that bring up this sort of feeling of inadequacy or not belonging, and it’s always like going back to the land to get that reassurance, staying in community for that reassurance. Farming has always been a gift. It’s part of who we are as Black and brown people, and the fact that it has been used as a tool against us, the trauma still exists. But what I am finding with people like Leah and so many young people is that they are in defiance. They understand the power that the land brings. They’re starting to understand the history that they have when it comes to farming. That is not in a textbook. You don’t learn it going to school, and you’re sure not going to learn it from the sort of conventional farming system. We’re using trauma as a weapon now and as a healing process for us to understand the fact that we were put in this position, not out of our own will but by the oppressors. And so what we’re doing now is taking back our stories, taking back our narrative, finding a way to heal. This is being passed on to this new, young generation that is much more proactive or defiant in the oppressive system that continues to haunt us. They are finding their way and they’re finding their voice, and they’re standing up for what is right for the Black community, and I’m not saying that we need to isolate ourselves from other communities and other white people, but the fact is, white people are not going to help us. They’re not the people who define who we are. We are the people who have to define who we are. When it comes to trauma, we don’t need fixing from white people. These are things internally that we are working on amongst ourselves, but we’re working on it, like Leah said, through the ability of love. Love and understanding, and understanding that when there is trauma, that there’s a healing process that is happening within the Black community to find solace and also to find ways of redemption. And so I’m glad that you brought up the issue of trauma because sometimes that’s not talked about when it comes to our community, but it’s something that we are dealing with internally. Leah: Yeah, I want to echo that internal piece, because I think when we’re talking about white folks, the primary job when it comes to agriculture and land is reparations. It’s like, “Y’all didn’t earn it. It’s stolen. Give it back.” Right? And the primary job that we as Black people are dealing with is decolonizing and re-indigenizing ourselves, which means uprooting colonizer patterns that would make us replicate the same kind of violent behavior as the oppressor, and also healing our internal trauma, because you cannot go through centuries of enslavement and sharecropping and lynching and violence and expulsion from your land and not actually have altered DNA, have altered epigenetics that are going to make you have a trigger response when you see the land again. You know, young folks come out here, they see the land, and they’re like, “Ah, slavery.” You’re like, “There’s no slavery. There hasn’t been slavery here for a long time.” Right? But why is that the association? It’s the cultural legacy. It’s also the genetic legacy of trauma. But just as the land was the scene of the crime, as my friend Chris Bolden-Newsome says, the land was not the crime. The land is a source of healing, because I really believe that if we get in physical contact with our skin on the Earth, we can receive transmissions of messages that we need. And then when we’re cut off, we go around with that ache, like, “Something is missing. I feel like I forgot something, but what was it? Where did I leave it?” And it’s when folks come back to the land. You know, we’ve had thousands, thousands of people come through now in a lot of programs, and it’s pretty universal that after a little bit of time on the Earth, a few hours or a few days for some people, that remembering happens: “Oh my goodness, this is what freedom smells like, feels like, tastes like.” It’s not us as humans who are doing that for each other. It’s the land doing that, that healing. Kate: So if healing happens on the land and so much of our community is urbanizing, I mean, not just in the United States but around the world, people are moving into more built spaces, what are your dreams for how people return to the land? How do you see this kind of healing and this movement going forward in an urbanizing world? Karen: So, and I guess I get this from Leah, it’s basically that a lot of white people got to give up their land. I mean, basically. There’s a lot of land and there’s a lot of stolen land, and so let’s not talk about pushing people away from the land in urban areas. Let’s talk about: How do we bring people in urban areas back to the land, especially land that was stolen? And so, we’re starting to have that conversation of reparations. I’m still waiting for my forty acres and a mule. I think my ancestors deserve that, and I think that the conversation needs to be less about what’s going to happen as more people come into urban areas. It’s about how are people in urban areas going to have their land restored, and that’s a conversation that we continue to have and are beginning to have amongst people who have land, lots of land, and most of it is stolen. How do they now return that land? Because I tell people—this is my sort of mantra that I tell people when it comes to power—either you’re going to share it, give it up, or I’m going to take it. In essence, this is what we’re starting to feel as Black and brown people. Our land has been stolen, so you got three things: Either you’re going to share it, you’re going to give it up, or eventually we’re going to take it. So that’s the conversation that we’re having within our communities, in urban communities, is going back to the land, not about trying to continue to find places in cities as more people come in. It’s like, “You know what? We got land. Where is our land? There’s stolen land.” So how do we have that conversation of returning back to the land instead of thinking about trying to build and find more land here in urban cities. Leah: Yeah, Mama Karen pretty much said it all. Nature exists under and between the concrete, so I also don’t want to say that just because you live in a city, you can’t have that connection. Another one of my mentors, in blessed memory, Brother Yusef Burgess, he actually grew up in the Prospect Park area of Brooklyn, and he found his whole world of nature in the acorns that he collected from that park. After a lot of traumatic experiences in his life, he went back to nature as a way to attain healing and ended up coordinating a whole statewide—through the Department of Environmental Conservation—urban youth program that took young people out to the wilderness. So you would see Brother Yusef always with a kayak and a bunch of children in tow taking the kids to the Adirondacks or the Catskills or out to Soul Fire Farm, and he was committed. So there is something about that dandelion in the cracks, the bird that comes to the feeder in the window outside of your elementary school building. It’s not that you have to be in a completely wild space to be able to access the wisdom of nature. It doesn’t mean then that that absolves white folks from giving up their land, so I’m not saying it contradicts Mama Karen, but it’s just not like all hope is lost just because you don’t have your forty acres yet. Karen: I’m still waiting for it. Kate: I know a lot of people are looking to both of you right now, your leadership, the clarity, the love, the strength with which both of you speak and live is really inspiring. What are your sources of inspiration, and where do you look in this work that you’re doing? I said, “You know, I feel that I’m blessed to be on this Earth, but I have to be intentional in owning the fact that whatever wealth that I have, whatever knowledge that I have, that the Creator gave it to me to share. Not to keep it, not to own it, because I can’t own anything. The only thing I can own is myself.” And so for me, the biggest thing, my inspiration is the youth, the youth of today. That’s where I get my encouragement. That’s where I get my strength. That’s where I see the possibility of changing the food system in such a way that when it talks about sustainability, when it talks about equity, it shows the faces and diversity of people. Leah: You get it, babies! And so, yeah, definitely the next generation—and it’s also the ancestors that came before us, Fannie Lou Hamer, Booker T. Whatley, Ralph Paige, in blessed memory. So all these folks, George Washington Carver, all these folks who really were visionaries way ahead of their time in terms of thinking, “We need to diversify our agriculture and conserve the soil and rotate our crops and have cooperatives.” All these things now that people are thinking are new and hip, these folks have been doing this for a long time. Kate: That’s so beautiful. Thank you both, so much, for sharing all of this. Is there anything I didn’t get to that you would want to talk about in the work you’re doing or in how you see farming today? Leah: Yeah, thank you. I mean, the only thing that I want to add is just as we talked about earlier in the conversation, it is a “we” thing, and so I want to name and shout out the Soul Fire team who are packing the CSA share right now while I’m all warm and talking on the phone, right? So Larisa and Damaris, Lytisha, Ceci, Olivia, Jonah, Jess, and Amani. That’s our team, plus our children Neshima and Emet. Nothing happens without everybody’s contribution, and so I don’t want anyone to think “Leah’s the movement” or “Mama Karen is the movement” or it just takes one person. It takes all of us. Karen: Yep, and I want to give out the shout out because I do a lot of traveling, but I can’t do this work without Lorrie, Michaela, and Jane holding down the fort. Well, yeah, go out and deliver a message! Karen Washington is a farmer and activist. She is Co-Owner/Farmer at Rise & Root Farm in Chester New York. As an activist and food advocate, in 2010, she co-founded Black Urban Growers (BUGS) an organization supporting growers in both urban and rural settings. In 2012 Ebony magazine voted her one of their 100 most influential African Americans in the country and in 2014 she was the recipient of the James Beard Leadership Award. Karen serves on the boards of the New York Botanical Gardens, Why Hunger, Just Food, and Farm School NYC. 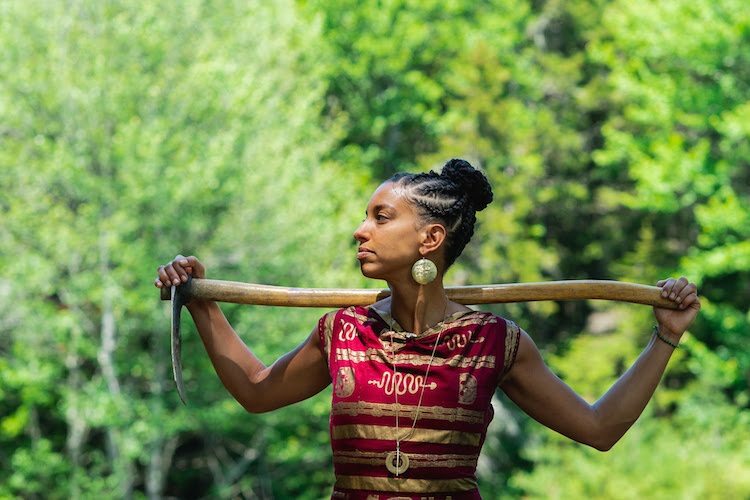 Leah Penniman is a Black Kreyol educator, farmer, author, and food justice activist who has been tending the soil for twenty years and organizing for an anti-racist food system for fifteen years. She currently serves as founding co-executive director of Soul Fire Farm in Grafton, New York, a people-of-color led project that works to dismantle racism in the food system. What does Earth ask of us? Sign in with Disqus or your favorite social media account. Or you can use Disqus as a guest. 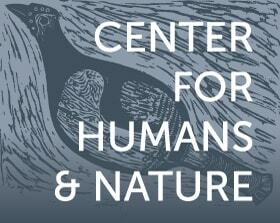 We share ideas that foster a socially and ecologically interconnected world.